This NASA graphic depicts the orbit of asteroid 2015 TB145, which will fly safely by Earth on Halloween (Oct. 31) at a range just farther than the orbit of the moon. 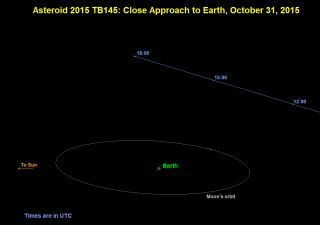 Asteroid 2015 TB145 — discovered earlier this month, on Oct. 10 — will fly by slightly outside the moon's orbit. In celestial terms, this is rather close, especially considering the asteroid's size; at an estimated 1,300 feet (400 meters) wide, this is the closest known flyby by a large asteroid until 2027. TB145 will fly by at 300,000 miles (480,000 kilometers) from Earth, but poses no threat to our planet. Little is known right now about its composition — optical telescopes will observe its spectral signature in a few days — or where its orbit will take it past the next 100 years. Chodas said once the radar telescopes at the Goldstone Deep Space Communications Complex in California and the Arecibo Observatory in Puerto Rico look at the asteroid, among other observatories, very detailed information about its orbit will be available.